Well what the HELL are you comparing me too? For me any day I can beat the S&P 500 or lessen the downside movement I consider the day a success whether or not clientele do!!!! It’s really hard to be invested in a headline risk market where every headline moves the market. 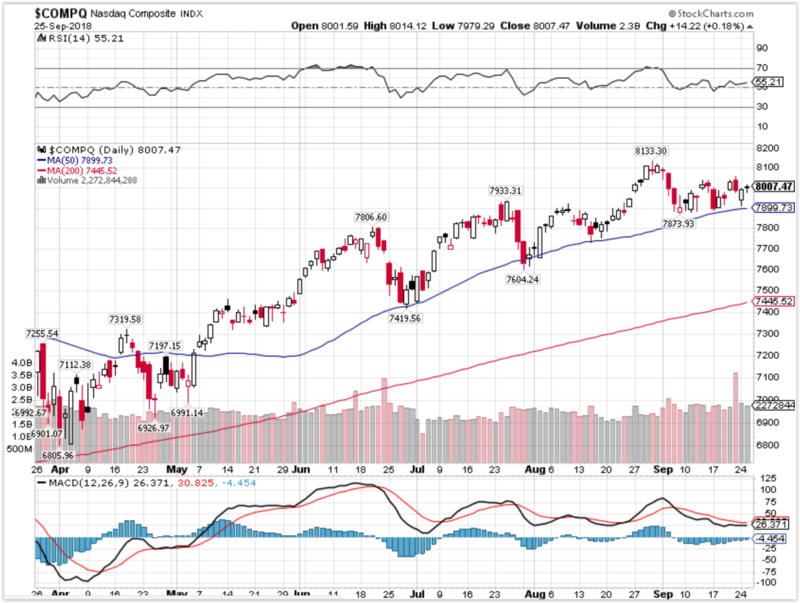 Where Will the SPX end September 2018? After the bell Friday, around $2.8 trillion in equities reshuffled into the newly created communications services sector. Those changes leave the tech sector looking a little different to investors. Among the biggest changes, Facebook and Google parent Alphabet moved out of tech into the new sector. Apple‘s leadership expanded to a 21 percent weighting, up from 17 percent, while Microsoftplaces second with a 17 percent weighting from 13 percent. Apple and Microsoft as the two biggest drivers should continue to lead gains in the tech sector, says Bell. The tech sector also became more weighted to volatile chip stocks such as Advanced Micro Devices and Micron, but Bell believes that could be a positive. It’s not just tech seeing a big change. The new communications sector absorbed the telecom space, ending its reputation as a defensive play. Alphabet has a 29 percent weighting in the new sector, while Facebook accounts for nearly 16 percent. Neither offers a dividend. Veteran fund manager Larry Glazer is worried too many investors are in the wrong trade. His concerns stem from the crucial role big technology stocks are playing in the record rally. If investors don’t diversify away from some of the year’s biggest winners now, Glazer believes they’re going to feel a world of pain. Glazer, who has almost $3 billion in assets under management, referred to Amazon, Microsoft, Apple, Netflix, Facebook, Alphabet, Mastercard, Visa, Adobe and Nvidia as some of the biggest names behind this year’s index imbalances. He also suggested sentiment in the market was getting out of hand. It sounds like a pretty bearish argument. However, Glazer isn’t classifying himself as a bear. According to Glazer, investors should shift their exposure to value names, particularly groups that typically do well as inflation rises and the dollar weakens. He likes financials, energy and gold. Plus, he suggested hard hit emerging markets are showing signs of a bottom. “You are starting to see emerging markets coming back. So, that global story is intact. The divergence is dissipating. 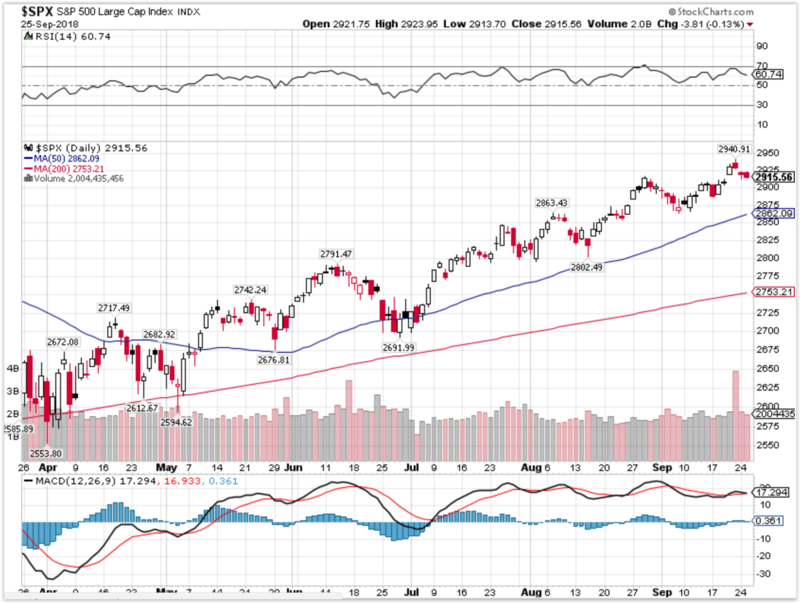 That’s what you really want to see to see the market go higher,” he added. His thoughts came as stocks rallied to all-time highs, with the Dow reaching its highest level since January 26. Those comments were laid out in a 71-page white paper that carried the Chinese government’s response to criticisms it received from the U.S.
“China does not want a trade war, but it is not afraid of one and will fight one if necessary,” Beijing said in the paper. Of note, those claims from China’s leadership mirror exactly what many experts say Beijing has, in fact, done. Yet despite the longstanding evidence of Chinese protectionism, the Monday white paper sought to position Asia’s largest economy as the global standard-bearer for fair trade. The two largest economies in the world have tried to find common ground on trade and business policy disputes, but several rounds of negotiations in recent months have not produced any breakthroughs. Over the weekend, Beijing reportedly cancelled mid-level trade talks with Washington and called off a proposed visit to the U.S. by Chinese Vice Premier Liu He. Nearly all respondents to the CNBC Fed Survey see the Fed hiking ratesa quarter point this week to a new range of 2 to 2¼ percent. Look out for two more rate hikes this year from the Federal Reserveto go along with economic growth nearing 3 percent and a central bank that eventually raises rates explicitly to slow growth, according to respondents to the latest CNBC Fed Survey. But forecasts suggest the president has some room for his trade policies to subtract from growth without doing enormous economic damage. Respondents look for GDP year over year to be up 3 percent in 2018, compared to 2.2 percent in 2017, and 2.8 percent in 2019, suggesting only a modest slowdown next year. Wharton finance professor Jeremy Siegel is known for predicting market milestones from Dow 20,000 to Dow 25,000. Now, the long-time bull is turning cautious — suggesting the probability of another leap higher is dwindling. Siegel makes it clear that he’s not completely abandoning his bull case for stocks. He considers the stock market a short-term buy. However, he believes it’s vital for investors to be aware of growing risks stemming from trade tensions and the Federal Reserve’s policy because they could spark a deep sell-off before year’s end. If another deep sell-off batters U.S. stocks, Siegel expects it’ll look like the one that began on Feb. 2. By early April, the S&P 500 was down 11 percent from its Jan. 26 all-time high. 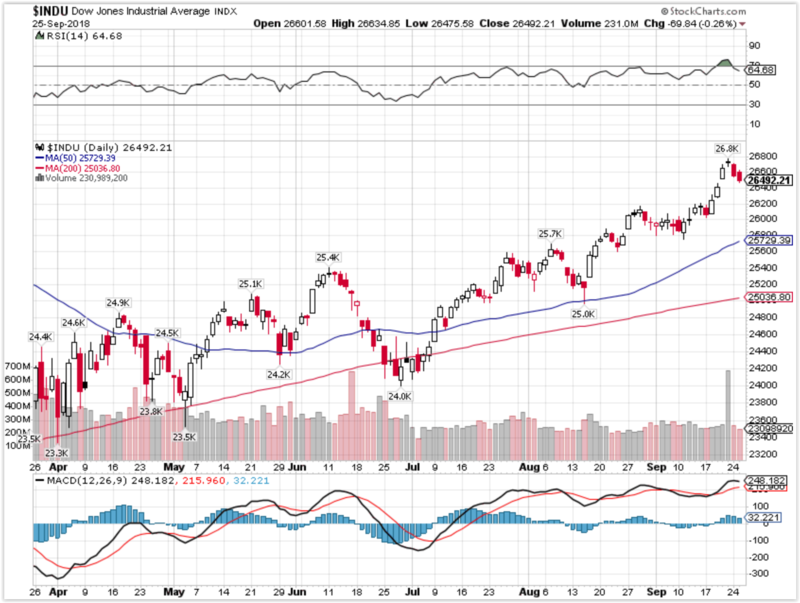 But it staged a powerful comeback, and now the index is up more than 9 percent so far this year. But this time, a snapback may not be in the cards. “We have some major challenges. The trade war is not yet resolved,” he said, adding that it puts pressure on the country’s gross domestic product. His second biggest risk to the stock market comes from the Federal Reserve, which begins a two-day meeting Tuesday. And, that could set up next year as a rough year for gains. By age 50, retirement-plan provider Fidelity recommends having at least six times your salary in savings in order to retire comfortably at age 67. By age 55, it recommends having seven times your salary. Are you on track? According to Fidelity, most 50-something Americans aren’t. As of the second quarter of 2018, those between 50 and 59 years old with a 401(k) had an average balance of $174,200 and were contributing 10 percent of their paychecks. On average, employers were matching 4.9 percent, putting the total savings rate for this group at 14.9 percent. While this group has a high savings rate, by Fidelity’s rule, their nest egg may not be big enough: If you earn $50,000 a year, you should have $300,000 in savings by age 50. If you earn $75,000 a year, you should have $450,000 in savings by 50. On the bright side, Fidelity reports that Americans aged 50 to 59 are saving more in their 401(k)s than they were five years ago: In 2013, they had an average balance of $128,900. Keep in mind that Fidelity’s data only takes into account those Americans with a retirement account and so can’t present the full picture. GOBankingRates found in a 2017 report that 40 percent of older Gen Xers (those aged 45-54) and 33 percent of baby boomers (55-64) have nothing at all saved. Read on to see how much you should be setting aside for retirement and how to get to that savings rate. For starters, Fidelity suggests that everyone set aside 15 percent of their income in a retirement account. “We believe if you save 15 percent throughout your career you will have enough to maintain your lifestyle in retirement,” Katie Taylor, VP of thought leadership at Fidelity Investments, tells CNBC Make It. Other experts, including co-founder of AE Wealth Management David Bach, say that if you set aside at least 10 percent of your income, you’ll set yourself up to be fine. Of course, more is better: Bach adds that if you want to retire “rich,” save 15 to 20 percent. If you’re not setting aside 10 to 15 percent of your income or you don’t have the equivalent of six times your salary saved by age 50, don’t panic. There are strategies you can use that will help you get to, or nearer to, where you need to be. Another useful tool you may have access to is “auto-increase,” which allows you to choose the percentage you want to raise your contributions by and how often. This way, you won’t forget to up your contributions or talk yourself out of setting aside a larger chunk when the time comes. What if you don’t have a 401(k)?